The North Coast Clinics Network works to improve the quality of care and efficiency of its FQHC members in northwest California. 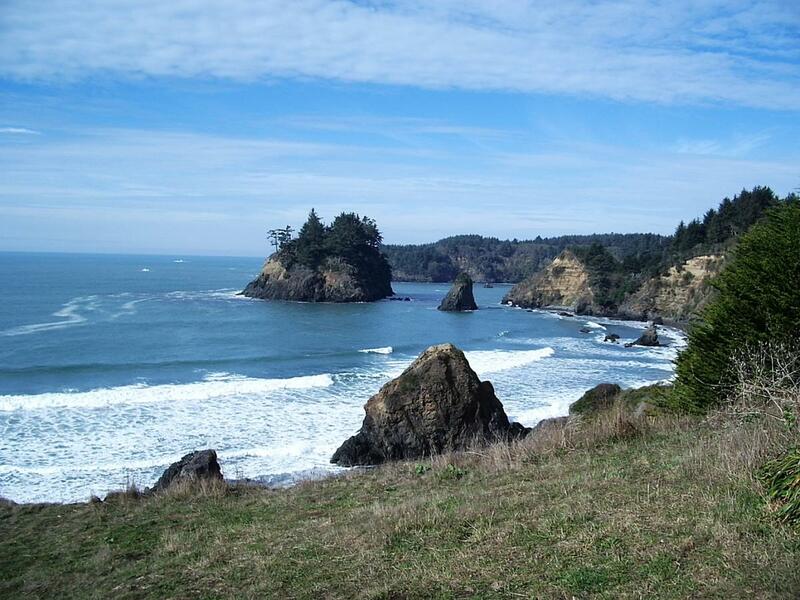 Pictured here is Trinidad State Beach, located 20 miles north of Eureka in Humboldt County, CA. The community clinics located in Humboldt, Trinity and Del Norte counties have joined together as the North Coast Clinics Network (NCCN) to coordinate the development of cooperative business plans which improve the quality of care and efficiency of Network members, to advocate for innovative Business and Health Information Technology (HIT) strategies that integrate all community providers into a comprehensive and accessible system of high quality health care, and to promote public knowledge and understanding of the important role of community clinics and the challenges of building healthy & well communities in rural areas. Rural residents on the North Coast will lead healthier lives as a result of collaborative partnerships with health and wellness providers and through education and access to family-centered integrated health systems. Trisha Cooke and Tim Rine of the North Coast Clinics Network were interviewed by NCHN’s director of member services to share information on the network’s characteristics, key learnings, accomplishments, and challenges. A: Our network is health center controlled and comprised of three FQHCs [Federally Qualified Health Centers] in northwest California with 13 access points. We are bordered by Oregon to the north, the ocean to the west, and a mountain range to the east, making us quite self-contained. We are unique in that our network serves one in three individuals in our region’s population, which equates to 63,000 patients and over 280,000 visits per year. Our patient mix is different than most rural networks. The breakdown is 15% uninsured, 40% Medicaid, 20% Medicare, and 25% private insurance. We have three strategic priorities, which are (1) ensure healthcare workforce readiness, (2) improve the quality of care, and (3) shape healthcare policy, particularly from a rural lens. Although our network is specific to FQHCs, we would look at an affiliate status, for example with the tribal clinics and county governments we work with. As a fairly mature network (established in 1996), we sought the HRSA Network Development grant to address some specific needs regarding practice transformation through a focus on quality improvement and data analytics. Q: What are some of the challenges and advantages of working in your rural area? A: We have a tough time recruiting providers. Access is limited. We’ve got more clients than we can deal with. However, we use technology and other modalities to address these challenges when we can. We do a lot of telemedicine across the board, from traditional care to dermatology and psychology to pre-surgical work to prevent patients from having to drive the five hours to San Francisco where the surgery will take place. Many providers do a Project ECHO model of peer networking, which helps isolated providers share expertise to support clinical decision making. We are also an AHEC, so we do educational videoconferencing to support continuous education needs. The collaboration that exists between providers is an advantage of our area. It’s not uncommon for providers to have their own practice and work in a hospital. The connections and relationships help us do innovative work. The Medicaid health plan invests in our network to provide technical assistance in training for quality improvement we deliver on their behalf. Q: What makes your specific jobs more or less difficult? A: Our work starts and ends with the relationships we form. We have successfully established a strong partnership with the health plan, which has been a great advantage to us and our community. Because it’s a small community, we can collaborate with their office. We can conduct outreach and get the word out about changes, education, or opportunities. Because of our background, they seek us out to work on various projects, from hypertension improvement projects to helping create a flyer for an educational session or bringing a trainer up to our area. We’ve been able to secure a role for ourselves as convener and change agent in the community. In California, there are 14 health center controlled consortia that come together four times a year, meeting in the central part of the state. We discuss what the landscape looks like and talk about what we can take on together. There’s peer support that includes sharing, mentoring, and hands-on one-on-one support that is really helpful, so that lone CFO or isolated provider has some connections and support. This is extremely beneficial in addressing challenges. A: Two and a half years ago in the state of California, there were 22 counties not part of a Medicaid managed care plan. The state didn’t want to be in that business anymore and did not look for provider input regarding the transition. They planned to give all of those counties to private insurance companies, and we were concerned this would be a monopoly. We worked with legislators to carve our eight counties out of managed care so they would not get dumped into the big bucket. We were able to get legislative support to allow those counties to go into a County Operated Health System (COHS). It’s a county organized health system structured with input from a board comprised of people who live in the counties. And since it’s a nonprofit, remaining resources get reinvested into the local system. Being able to have financial stability from a partner that’s not profit driven was significant. We were also able to get Democratic and Republican legislative agreement and support. Q: What’s been a key to your network’s success? A: We have stability and longevity in senior management. We also have engagement from the board, member clinics, and staff. Our peer group is important. There are two other networks in northern California. We are the smallest, but together the three of us have half the state, so the three network directors join forces. After our last webinar, we got calls from all over the country asking if we’ve heard of this or dealt with that. Q: Based on your experiences as network leaders, what advice do you have for a developing rural health network? A: Get to know your members. Go on site and really ask questions and be curious, because it’s that relationship building that helps us succeed. We can always seek specific skill sets that we need, but relationships are what drives change and builds trust and helps us to keep improving. Listening is first and foremost. When you’re a member-driven organization, everything revolves around those folks. What are they asking you to do on their behalf? Sometimes we as leaders think we know better than our members. You need to consistently check in. We are continually reaffirming that we’re listening correctly and are on the right track. With all the practice transformation that is taking place across the health care system, you don’t have to start large. It’s that small action you can take to improve your work. Think about what you could do today, right now. Getting overwhelmed can stall you, and the solution doesn’t have to be big. For example, one health center was working on improving communication across the organization. They had a long-term plan to conduct training and shift their human resources processes, but one of the greatest impacts was a health center staff person who started sending out inspirational quotes about communication daily, which sparked conversation among staff and led to staff engagement for the project.